An interesting debate is taking place in Vietnam: should the country adapt the lyrics of its national anthem? Deputies are asking the question of whether the revolutionary “Tien Quan Ca/Marching Song” is apt for the modern age. “I find the current national anthem has a glorious melody and it goes into people’s mind,” said deputy Huynh Thanh as reported in VietnamNet. “But the lyrics should be changed to suit a new period of development of the country. For example, it is necessary to change words such as ‘The path to glory is built by the bodies of our foes’,” he said. Speaking personally, I’d say he has a point – one that I have already made here and here. Many anthems are dark, violent affairs. Look no further than the French and Irish ones, for example. It says something about human development that so many countries were born in war, and feel the need to celebrate this in their anthems. But experience from other countries tells me that Deputy Thanh has little chance of success. People are particularly sensitive about national anthems. Hardly a week goes without American media reporting someone fluffing the lyrics of the “Star Spangled Banner”. I also remember people being outraged by a proposal to translate it into Spanish (despite the fact that Belgium and Ireland both have official translations of their national anthem). 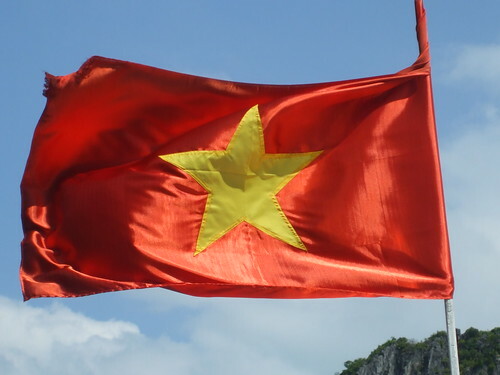 Predictably, the Deputy Director of the Vietnam Music Copyright Protection Center, said that the National Anthem is a symbol of history and it is unnecessary to change the lyrics. “The National Anthem is a symbol of the history and it does not function to reflect the reality of life,” he said. That about says all I need to know about attitudes to national anthems for me. What do you think? There are some real stinkers out there. Can you see any occasion when changing a national anthem would be appropriate?